Asis Nasseri founded the band back in 1991 as a death metal act, soon this genre limited him too much and so he tried to push the limitations of the genre and break out of the narrowness of death metal. He combined metal, medivial music and classic. The band grew in numbers and nowadays Haggard is an ensemble of 16 musicians! In 1997 their debut And Thou Shalt Trust... The Seer been released. Two years later Awaking The Centuries followed. Both albums were pretty successful and so the 16 band members and a huge crew flow to Mexico in February 2001 to record a live album and DVD (also available as VHS video). The live material is called Awaking The Godz. An unusual project, but Haggard is unusual and outstanding. Live the material is more intense. 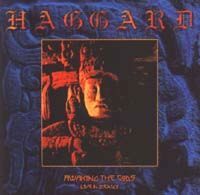 And for metal fans who aren't fans of Haggard yet, it's a good chance to learn about the band and probably get enchanted by the unique sound.